And the same is true today. 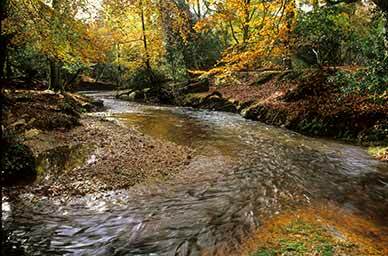 Follow one of the New Forest streams from its source to the New Forest boundary and there is a fair chance that every type of landscape, every type of scenery will be enjoyed along the way. And there are many streams to choose from: Linford Brook, Dockens Water, Latchmore Brook, Ditchend Brook, Mill Lawn Brook, Highland Water, Black Water, Ober Water, Bartley Water, the Lymington River, the Beaulieu River and far, far more. From April to September, and sometimes later, slow flowing New Forest streams are home to myriad dragonflies and damselflies of sometimes baffling variety, and where nutrient levels allow, aquatic vegetation includes magnificent stands of yellow iris and more abundant, but much less showy, marsh St John’s-wort. Faster flowing, gravel-bottomed woodland streams attract in particular the delightful, beautiful demoiselle damselfly, and where steep-sided, from March to at least mid-summer are home to that brightest of British birds, the kingfisher. Grey wagtails, too, visit to raise their broods before departing in search of easier winter pickings, and little egrets and mandarin ducks are also increasingly seen. Twenty species of fish are present in the New Forest streams, ranging from primitive brook lampreys, to eels and even pike, but it is brown trout that most catch the imagination. Many are present all year round, but these are joined in late autumn and early winter by the migratory form of the species, the sea trout, returned from the oceans to breed. Indeed, there’s no stranger sight than one of these sea-going monsters struggling along the shallow upper reaches of a New Forest Stream, searching for gravel beds with good water flows in which to lay its eggs. Streamside lawns have formed where, in times of flood, water overflows the banks and deposited minerals that enrich the often poor New Forest soils sufficiently to sustain strong growths of grass. 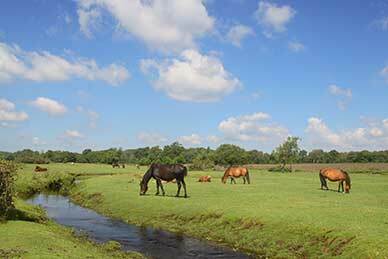 Here commoners’ stock congregate – ponies, cattle and donkeys – to enjoy the feast. Deer, too, at dusk emerge from cover to feed, whilst in spring and early-summer curlews, redshank and snipe probe the damp ground in search of invertebrate foodstuffs. Winding ribbons of fresh clean water, all these New Forest streams are largely free of man-made pollutants, although not necessarily man’s influence. Notice, for example, meanders now cut off from the main flow, that still, though, fill with water after heavy rains; and stretches of stream that even to the untutored eye appear too straight to be natural. These are indicators of ‘improvements’ carried out over the last 130 years or so; streams straightened, widened and deepened in efforts to hurry the water through, reducing flooding and consequently improving timber growing and grazing conditions. In the process of 'improvement', however, important riverine and bog woodland habitats have been badly affected, habitats that are now rare in Britain and the rest of Europe, whilst gravel beds so important for spawning trout have been reduced in size and quality. But recently, as part of the ‘Sustainable Wetland Restoration in the New Forest - LIFE 3’ project, isolated meanders have been linked back to their parent streams, and other restoration works completed, offering the promise of a return to the streams that John Wise knew.